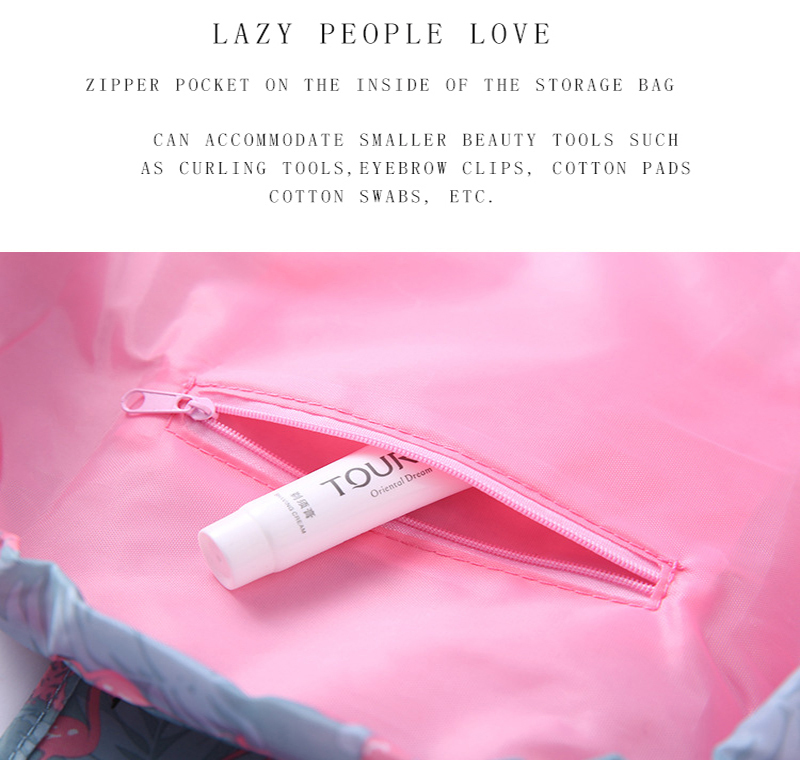 Carry all your make up around easily with our Quick Lazy Drawstring Cosmetics Bag! Pull the drawstring cord and the bag cinches completely closed to stow or travel. 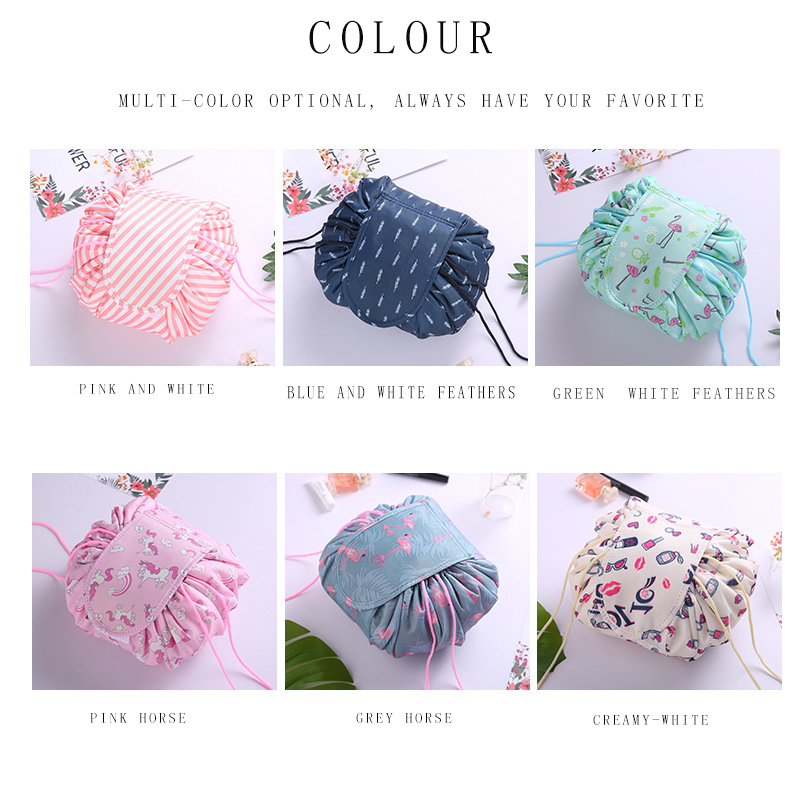 You can easily pack the bag in your suitcase; tuck it in your overnight bag because our Quick Lazy Drawstring Cosmetics Bag conveniently fits anywhere! It’s a smart and easy 4-in-1 solution, clean surface, quick cleanup, carryall, and storage. WATERPROOF MATERIAL: Made of high-quality Oxford cloth, dirt resistant and easy to clean. You can use it as a toiletries bag, storage bag, travel bag, the bathroom receive bag, makeup receive. 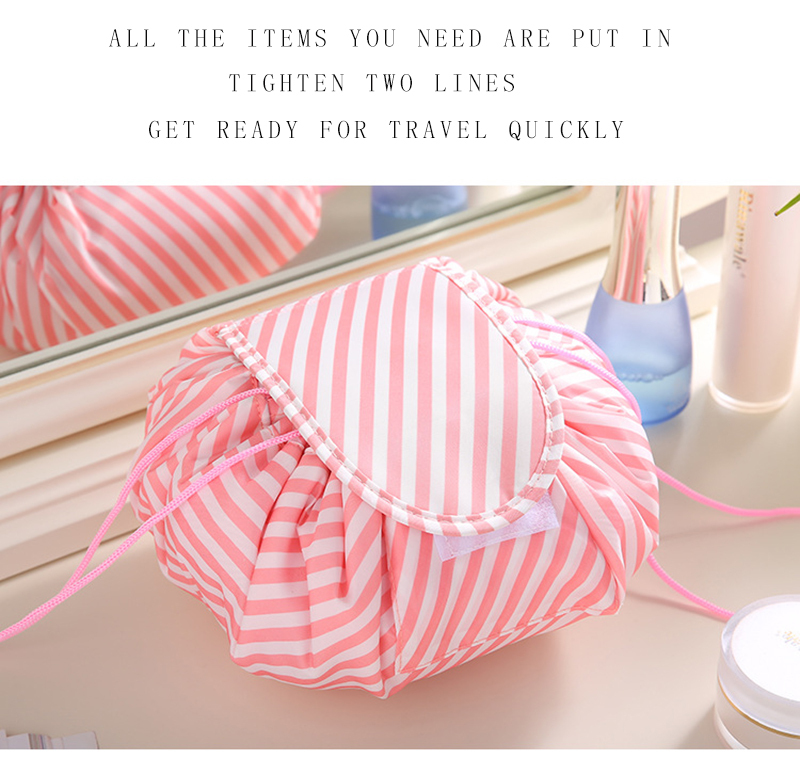 STYLISH DESIGN: When you open the drawstring, the bag layout completely flat within seconds, you can see all of your toiletries and cosmetics at once.No more digging and dumping in a traditional black hole makeup bag.Easy to find everything. 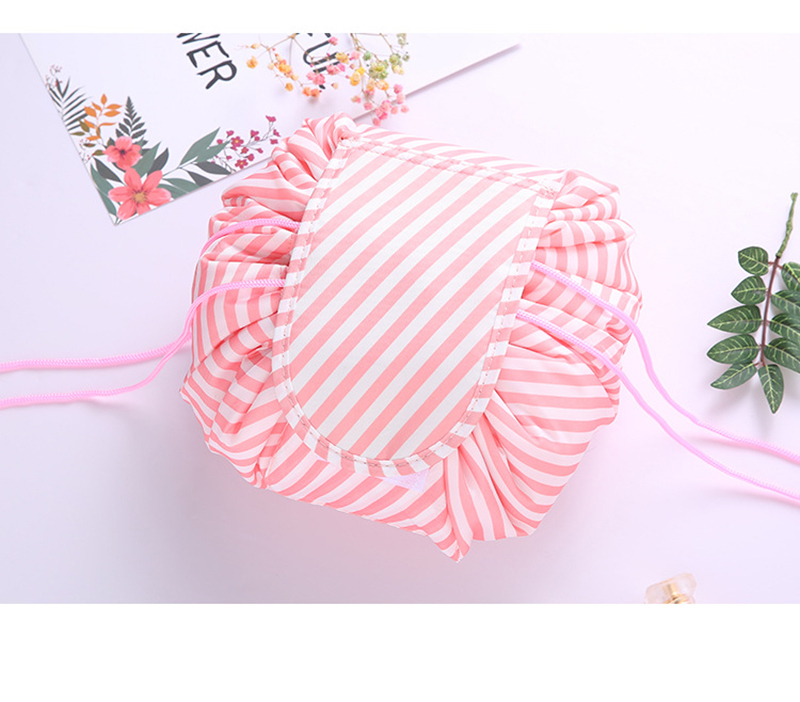 MAGIC POCKET: The outside has a mini pocket, the Inside has two zipper pocket, which can be respectively provided with small beauty tools, sharp cutting eyebrow clip or cosmetic cotton and so on. Solve the trouble of carrying small items. FUNCTIONAL: The inside has two zipper bags, the outside has a mini bag, which can place some small items or scissors swabs and so on. Inside space large enough to put all the daily essentials into the single bag. 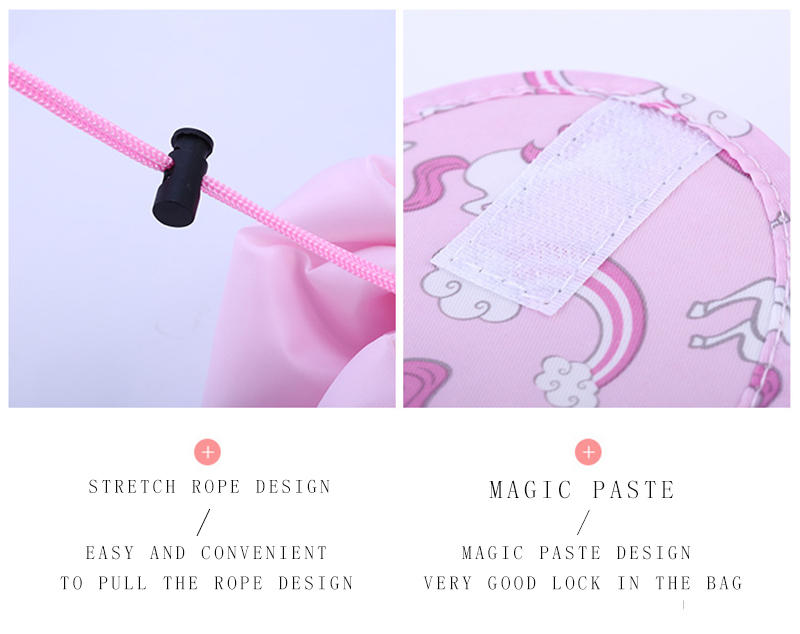 tighten both sides of the rope, fast storage when traveling. It has room for everything you need without becoming bulky or heavy! Traces of precision lathe and uniform flat package greatly improved product quality, delicate appearance give a better visual experience to you. TRAVEL ESSENTIAL: It is enough to put all the daily essentials into the single bag. Foldable, portable and lightweight, easily put it in your backpack or luggage. Perfect for organizing your personal, household, and travel items, suitable for both home and travel. Price 218 p Payment 23.11 took the post 17.12 Moscow. Cosmetic Bag is good. Without thread and smell. Only crooked seams. AND it is very much to expect)))) not stared size))) and yet not have so much makeup. Just things like brush so that's not stored in накиданном condition. Honestly not much annoying process opening closing, if just need what kind of thing is not great find and quickly. It Is open until you close as it is not thought out. Of Course there are 2 kormashka with zipper and one just, but as it is for me not guddd. The idea is very cool one two three four and everything in sight. Put A4 size paper. Order for Wife. It feels as expected. The Wife happy. Like sooooo spacious. Neat 20/10/2018 arrived on 14/12/2018. Product complies with the description. Are met. My bag not closed completely)) Now Check expiration dates, we can throw anything))) 3 weeks. To CET. Washed stiralka. All the rules. Recommend! 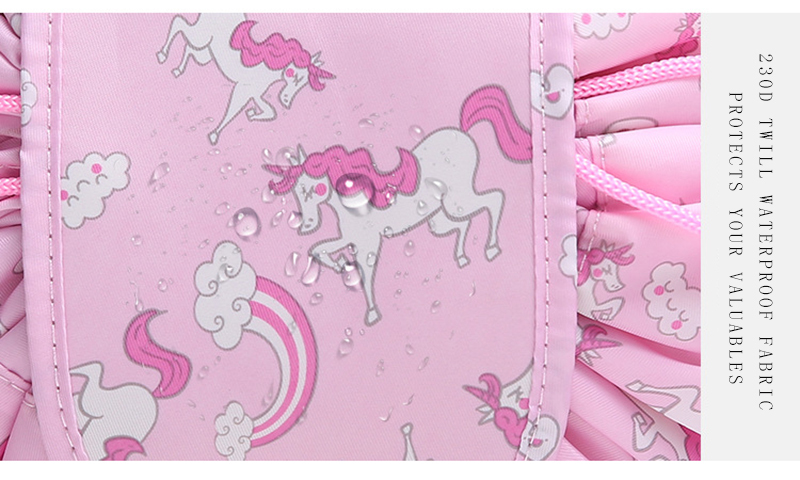 For mom kids, that and strive to something pull off of Cosmetic Bags is great stuff. All the mind when applied to make-up and in case of an emergency attack from outside makeup can be dramatically protect from налетчиков. Delight! Good bag, nice color and well made. Use for storing your handiwork. Quick 2 week delivery, item is exactly as described. I ordered 2 more to give out as gifts! To Polish ordered 01.11.Paczka future 26.11.Szybko.Wszystko ok. Very good!!! It is perfect, just as described. Very light too, which is good when we need to carry it. Loved! Cosmetic Bags received. Thank You Very Much. Sewn neatly. All match. Recommend. Cosmetic Bag is cudowna. Very large capacity. No wash what miałam till now. Quality and design perfectly. Excellent seller's work, packaging + shipping + shipping 5 +. Polite and friendly, and thank the staff of the store for a wonderful product. Suggestions other than trade, truthful and customer friendly. 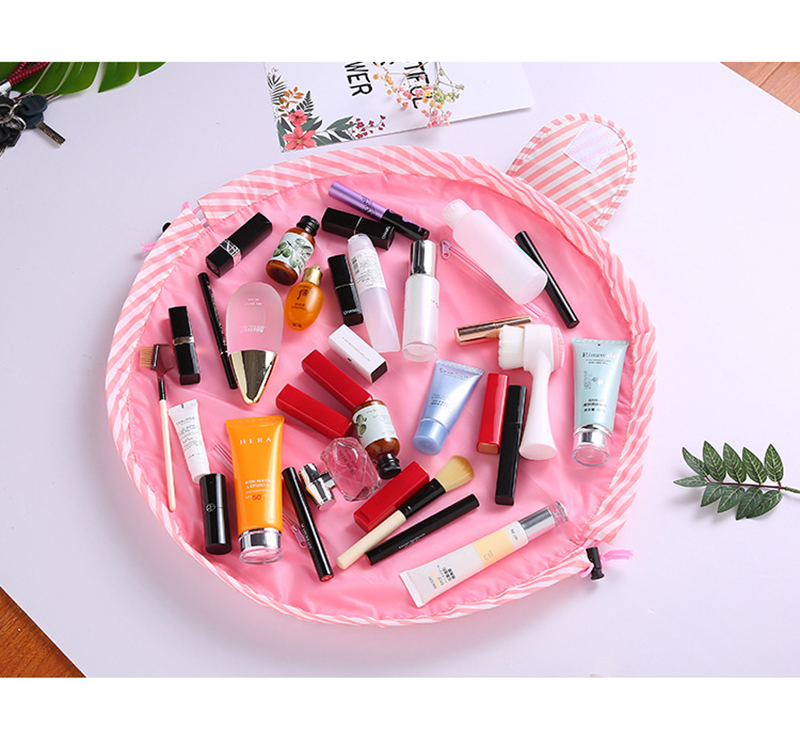 5 + + + + + + Inside two pocket, very convenient for small cosmetics. The first order took niece, very convenient organizer So ordered a second. Thank You Very Much.